Montreal-based developer Paper Cult makes their game debut today with Fat Mask, an action puzzle-platformer that tasks players with matching colored blocks together to build big combos and score big points. While the title largely has a multiplayer focus, there is a co-op mode you can enjoy with some friends. 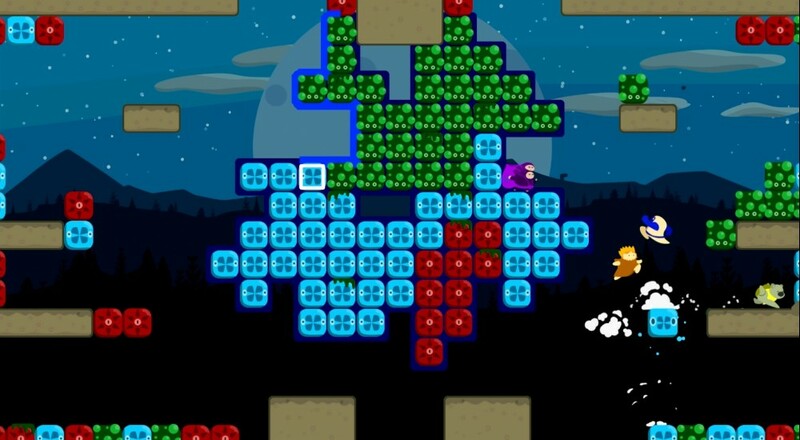 In the main "Free-For-All" mode, players must compete against one another to get the most points possible by linking up matching colored blocks to pull off big combos. Before you get those points, though, you have to wait a few seconds before it locks in. During that time, other players can steal away your combo by linking up new block with it. In the "Team Co-Op" mode, however, you don't need to worry about having your combo taken away. As a matter of fact, your main goal is to work with your fellow teammates to make the biggest combo possible. Your only foe in this mode is the clock, represented by some flashing red squares that close in from either side of the screen. By completing combos, you add some time to the clock and push back those squares for a little longer. The catch here, though, is that the more combos you complete, the tougher things get and you'll have even less time to get those combos squared away. Fat Mask is out today on PC via Steam. It will retail for $9.99 and supports up to four players locally. Page created in 1.5639 seconds.